Finn from Adventure Time. Also cute. Cute too. Couldn’t you find a picture of a cute boy that showed any less? 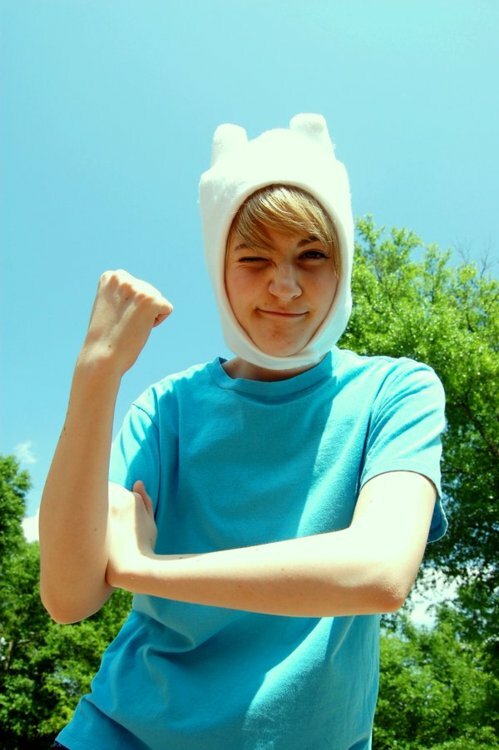 I reckon this is just about a perfect Cosplay of Finn!! Right look, right spindly arms, right shirt. You seldom see him without the hat but when you do, he does have unruly blond hair. Maybe Horselips doesn’t understand Cosplay and who Finn is, which is unexpected because Horsey is usually up to date and spot-on with his comments (IMHO). I’ve never seen Horsey, of course, but I got this sudden idea that maybe he could Cosplay Jake the Dog? I was just in the mood for some hot boy flesh and this didn’t do it. My friend and I were going to do cosplay together but my dog chewed up my costume – I was the back half of the horse. I so wish I had some kind of an “award” to give you for that comment with only one modification; “am”. Your best one to date!